The young man at the counter ushered us into the small dining area at Kumaravel Chettinad Meals. It was 2.30 in the afternoon and the timing was perfect - the restaurant was empty. 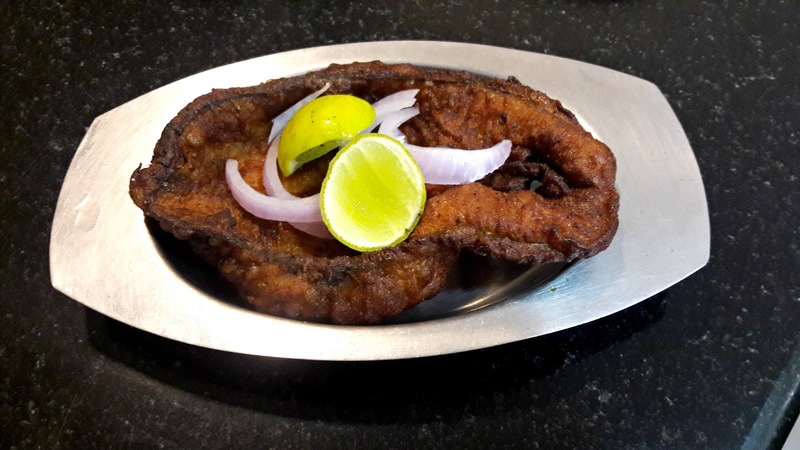 My friend had called ahead and asked them to keep a plate of biryani and batter fried fish. It was a smart move as the rest of the biryani was sold out by the time we reached. They brought out a large tray with nine small serving dishes that contained the day's specials. The specials consist of seafood, chicken and mutton and the sum of the goat's parts! Military hotels are very popular in Tamilnadu. 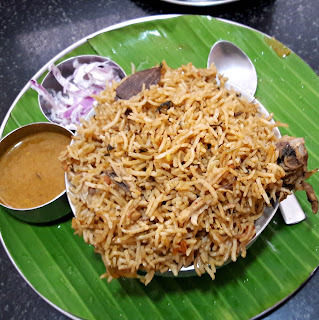 Kumaravel, the young owner and grandson of the owner of the erstwhile Velu Military Hotel explained that there was a time when men serving in the military were used to eating non vegetarian food wherever they were stationed across India. 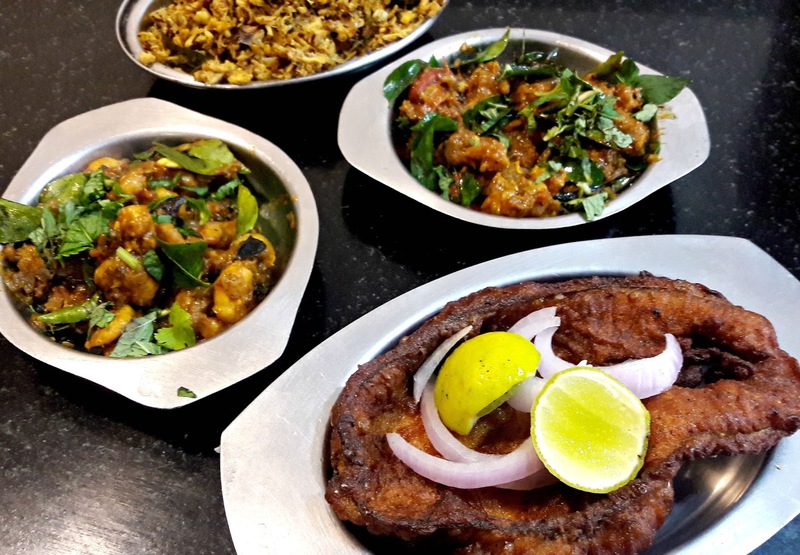 When they came back to their hometowns on leave or retired, they missed meat dishes as food made at home was vegetarian. Small establishments cropped up in these towns where meat would be cooked and served. In course of time, they came to be called military hotels. Meat like quail, rabbit, chicken and goat, would be cooked in large quantities. Nothing of the goat would be wasted, including the head, liver and offal which were regarded as delicacies. And seafood, of course! The biryani we had reserved was brought out, served with onion raita and a small bowl of chicken gravy. 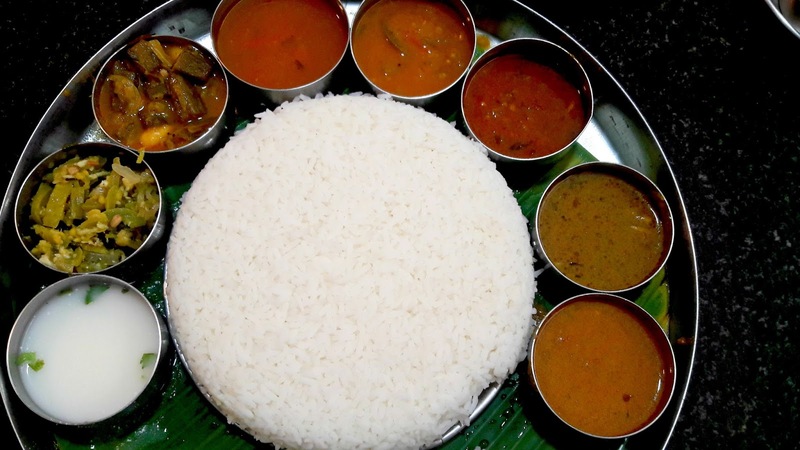 Cooked in typical Chettinad style, the rice was long grained and there were flecks of fennel seeds. It was spicy and aromatic and the pieces of chicken were tender. The gravy was a good accompaniment. Not just meat but fish and prawns are on the menu. Flaked and cooked shark meat is very popular, so also chicken podimas. The chicken is cooked with spices till dry and then the meat is flaked, almost like floss. It was a winner of a dish, small bones were the only irritants. We ordered mutton sukka and prawn fry. In the kitchen, small prawns in a thick peppery masala are tossed in a hot pan till heated through and a handful of curry leaves are added, both for flavour and as a garnish. The mutton was similarly anointed and a gravy served separately. While the prawns were delicious, I felt the mutton lacked flavour. The gravy also failed to impress. Along with the biryani, we ordered a vegetarian thali that consisted of a huge serving of rice, chicken, mutton and fish gravies, two kinds of vegetables, sambar, rasam and buttermilk. 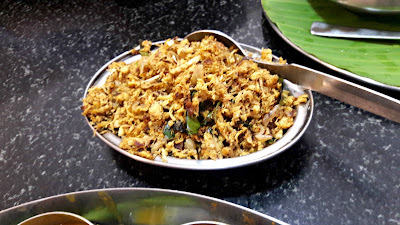 True to the Chettinad tag, the gravies were aromatic with the scent and flavour of spices, chilli and tamarind. 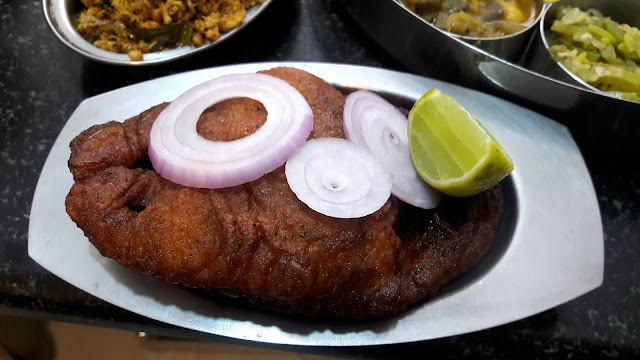 The fish curry was simply outstanding, having been cooked for long on a low heat, the flavours had mellowed beautifully into a mildly tangy gravy. The piece de resistance was definitely the crisp batter fried fish. It is a house special and you need to place an advance order for it - a big slice of kingfish coated with a batter and fried. The crust was crisp and the fish within it perfectly cooked yet moist. Squeeze some lime juice over it and you could just make a meal of it. The restaurant is clean and service is snappy. Which was good for us as we could photograph the food and enjoy the meal at leisure in spite of tears streaming down our faces and runny noses. 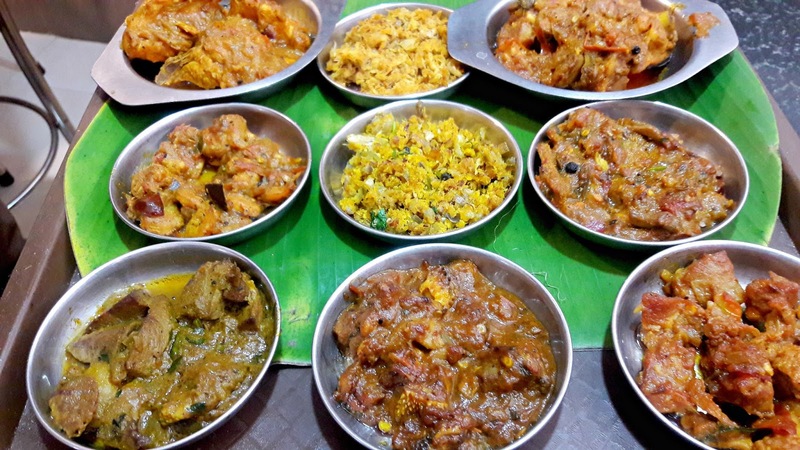 Well, that's what a good Chettinad meal is all about! 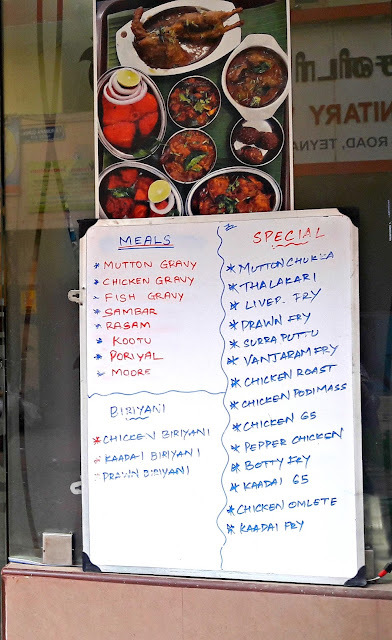 Kumaravel Chettinad Meals is located at 130/2, off Eldams Road, Teynampet, Chennai.